I feel like I just wrote about Ellen DeGeneres and Portia de Rossi buying designer John Saladino’s romantic stone house known as “The Villa” in Santa Barbara, so I was surprised when I looked it up and realized it was actually four years ago (time flies!). That’s actually a long time for these serial house flippers to stay put in one house, so they must have really liked it there. And who can blame them? It’s a pretty special place. I pulled up the old photos of what it looked like when they bought the property so we can see how it’s changed since then. Take a look! I originally wrote about Saladino’s villa in 2010 when it was on the market for $24.5 million. It came out in 2009. It’s amazing how much hardcover copies of this are going for right now! Wow. Ellen DeGeneres and Portia de Rossi have owned more than seven homes together — including this Santa Barbara, California, villa, which is now on the market for $45 million. Set on more than 16 acres, amid olive trees and overlooking the Pacific Ocean, the two-story, 10,500-square-foot residence features special touches like a classic barrel-tiled roof, terracotta surfaces, rustic exposed ceiling beams, 18th-century Italian tiles, vintage light fixtures, and walls of locally quarried stone. There are six bedrooms, six full baths, and nine fireplaces in the house. Most of the changes to these rooms seem to be decorative. Which version do you prefer? Can you even call this a pool house when it’s this big? Guest house, maybe? Ellen hosted the HGTV show “Ellen’s Design Challenge” and has several decor collections, including her own ED line. *Update: Netflix executive Ted Sarandos and his wife Nicole Avant bought The Villa for $34 million. *Note: There are Amazon affiliate links in this post. Thanks! Great post about a great house. Don’t tell Ellen (I like her), but I’d rather live in the Saladino version–it’s cozier and looks like he understands the space more. Of course with those views, I’d be happy enough sitting and sleeping on hay bales. I also prefer Saladino’s version. I prefer modern pieces sprinkled in among more traditional furnishings. But Ellen’s taste is very modern. What’s nice is that she and Portia only really changed the furniture, but made no significant structural changes. You could (if you had $50M!) change it back to a Saladino vibe without much trouble. Beth I agree with you. The Saldino version looks a bit more lived in and cozy. The ED version is a little too contemporary for the house. I am the odd duck here…but I prefer Ellen’s version! I just love how slick & modern it is. If I owned the place I would just add a few splashes of color. Oh my gosh! Saladino would be sick at his stomach if he saw what Ellen has done to this home! I have to say that I am. The Saladino version was to die for! Now it’s cold and uninviting! I also prefer the Saladino version. It just much cozier and charming I think. Amazing!!! I love the stone walls in the dining room (the second pic better). Stunning home! I am the cottage type, so the house overwhelms me, but I have to say I love the stone and the way the outside (i.e. nature) comes inside and swirls around as if it belongs there. And it does! I have always wanted a cozy cottage, and with very little money I am working on that now. I must admit not long ago modern elements seemed cold to me- — they reminded me too much of the supercilious decor of the 50’s and 60’s. Now I like what Ellen has done here. Every object in the house reminds me of the organic element of the gray stone, and it works! Each piece in the house looks as if it has been sculpted, and I like the juxtaposition of the ancient-looking stone and the modern reflection of it in the furnishings and art. It just works! Compared to the Saladino style (which I like also), Ellen’s and Portia’s touch seems to bring out another side to the sleek stone. Like Pygmalion she has found a face in the stone, a different face no doubt, but one that works beautifully with the natural elements of this stunning villa. It’s a beautiful home but too much stone for me ,too grey! Ellen has a great esthetic but I’m old fashioned or” traditional ” in my style. It seems to me that the old world design of the home works better with the original interiors, but everyone’s tastes are different. I would prefer to see antiques, warm lighting, paintings and tapestries… or an interior design reminiscent of Cary Grant’s villa in To Catch a Thief. Thanks for your great blog and the research and dedication that goes into it! I’d hire John Saladino to bring the house back to life. Cote de Texas did a great article on the house he downsized to in Montecito. He bought it from another interior designer. John used all his antiques and rugs from the villa in his one story home, simply stunning. Don’t like Ellen’s style too modern generic lacks comfort and warmth. I’d tear down the modern pool pavilion, she should have copied what Bunny Williams did in her Connecticut home. It would have been perfect on this property. I like Ellens version. Not that I could live with it – not as cozy. But with a few tweaks in furnishings here and there, I could do it. I’m not a fan of the “old world” look because it’s so heavy to me, and all that drapery is a dust magnet! ACHOO! Love the stone though! And the views. But you can’t pay me to live in Calif. for any amount of money! I’d rather have Santa Fe! How amusing! Stay right there! Montecito is heaven……and if you love Santa Fe…….perfect for you! I forgot to say……you live in “Mo.” I don’t think that is Santa Fe! ? Saladin. Ellen’s is so cold. All that stone needs warming up and please, lots of color. I like Saladino’s version too! It fit nicely with the style of the house. You are my soulmate. I agree with every single word you say. Brava!!! I’m not exactly sure how they are almost doubling the price for “just” decorations. They didn’t change a lot, because nothing much can be changed. I think both versions of the house have their appeal, though for me the Ellen and Portia version seems a bit darker, and I like my rooms bright. I ADORE stone. But I want color. Give me Saladino. It is a great house, though. Yeah… I don’t think there was really anything to “restore” here. She just redecorated, and not in a way that fits the house at all. The original style was a little *too* old-world for my taste, but her extreme contemporary fixtures and furnishings feel almost offensive to the structure. And I love Ellen, but that’s a pretty steep 4-year appreciation she’s expecting for what doesn’t appear to be much structural work! I love Ellen’s style as it feels fresh and updated to me. Saladino’s style is very nice, but typical and what you’d expect upon entering. I think Ellen’s pops and brings something unexpected. I love the contrast of the old stone and modernity (is that a word?). I’ve been in love with Saladino’s Villa since the first time I laid eyes on it. It was perfect when he finished the restoration and I love that his style fit the house. Thankfully Ellen didn’t permanently ruin it. Hopefully the new owner’s won’t either. I disagree with Ellen that a house is just like a canvas that you can put anything on (or in). Some houses have a feel (or life) and history that you should respect. Even though the house isn’t as old as it appears, it was built in 1930, it is one of those houses that deserve that respect. Thanks for sharing that it’s for sale. Wish I had $45 million. It would be a dream house I’d never get bored with. I prefer the modern version of this house that allows the house tobe the star rather than the decor. Saladino’s precious stacks of books and fussy curtains that serve no purpose obscure the architecture rather than enhance it. Ellen’s version looks like it would be much easier to live in. As to the price, we have no knowledge of what systems needed updating or replacing, what unseen improvements have been made, and the change in the real estate market over the past few years. I prefer Ellen’s eclectic, modern style – but would love to see more color (I know she’s more into neutrals). And for those who are questioning the price, I think that at these price points it’s standard to just aim extremely high. And then even if you don’t get your whole $45 million and you end up getting $33 million, you still made a tidy profit and the buyer thinks they got a steal. That’s my guess at least since I couldn’t even afford even one stone of this place! Ha!! I’ll have Ellen’s style or John Saladino’s, I love them both. For me the highlight is the kitchen. Love the slickness and the grey colours. Thanks for an awesome post. I prefer Saladino’s kitchen to be honest. The homey touches in there are just perfect. As for the rest of the house, some of his “fussy” choices are not for me, but I think both their tastes suits the home which, in the end, is the true star. And that yard with those old trees, so divine!!! I read everyone’s comments and agreed with them all because I can see why some like the ED style and some like the original. I guess I can’t say I like one better than the other because I don’t really like the house! I love the land and obviously it’s location, but it seems almost like a cave with windows. Too much stone and not enough softness. Gorgeous! If I had to choose, I do prefer the Saladino style. It’s definitely cozier (a lot of contemporary comes off cold to me) and fits the overall style, size and design of the house. With so much stone, I think you need more fabric and soft textures, as he had. I love how he has the bed “floating” in the master rather than the traditional method of placing it against the wall! I much prefer Ellen and Portia’s re-do. Saladino’s decor is so theatrical and over the top with opulence that it’s too much. 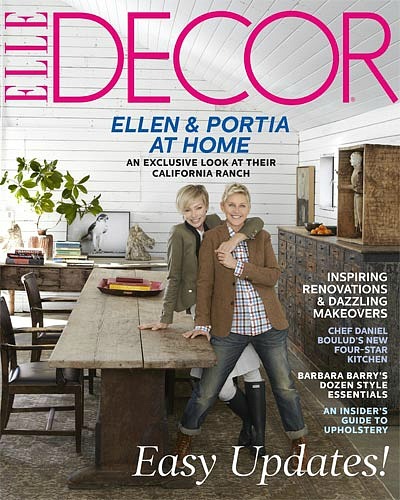 I love that Ellen and Portia make the bones of the house itself the star. I like their modern design but some of the furnishing I’d change but all around, much fresher, younger and more livable to me. Thanks for sharing! Love it! I saw Saladino’s article on this years ago and I loved it for beautiful romantic design but I LOVED the house and wanted it with a different interior. this entire exercise is so fascinating. I know John and I saw the house before; during…….and then after. It is my favorite house I have ever seen…..and I have been an decorator for 46 years. John is a total genius, in my opinion. He also started with a ruin. And made a magnificent restoration…..never have I seen anything like it. I have no respect for Ellen not giving him credit in her book. She took credit. It just is pathetic to me. I will never understand it. He spent 4 years and “caissons, plumbing, electrical…….on and on and on…..I watched it! Normal humans would never have even touched it! However; that being said; this house the way either one of them furnished it….is not for everyone. It is magnificent……it is intimate…..I could move in to it with my toothbrush……when John lived in it….. But, as these comments show…….this house is not for everyone. I hope who buys it will love and appreciate what John did to restore and even more; create the most magnificent house I have ever seen! I have not read the book and if it’s as you state that Ellen did not give Mr. Saladino the credit he deserves for restoring it then that is sad. She only changed the furniture, she didn’t do anything to the walls, floors – just minimalist decor, which I prefer, but yes a huge appreciation for Mr. Saladino’s devotion to restoring a unloved beauty. I remember seeing the photos of the home when he got it. It’s a gorgeous home architecturally and it could be decorated with the worst furnishings in the world and the house would still be beautiful. If anything Ellen’s decor has not just emphasised the beauty of her bones but proven that Saladino’s restoration was absolutely impeccable! I agree with you completely! She has done nothing except change the furniture; and that is exactly what you said. The job that John did can hold up beautifully. I would like to be able to just afford all the pea gravel! The outside is what truly sells it for me. the outside connects beautifully with the inside. Photographs…as brilliant as they are….do not show what this house feels like inside….and out. Gorgeous. It is permeable…..lovely, noisy (deters burglars) and ever so romantic! You CAN afford it! Between the two, I prefer the Saladino styling. But really, I would not want this house. While I love stone houses, this one is so big that the light from the windows can’t penetrate into the middle of the rooms, so you’d have to have the lights on all the time. It reminds me of a cave. I wonder what it looked like when it was first built and they didn’t use the recessed lighting? Actually, John Saladino used practically no recessed lighting. Spots attached to the ceiling. In the buildings Ellen added, there are recessed lights. Yes, recessed lighting is the worst, especially when it’s added to old houses. I don’t think spots attached to the ceiling are much better, though. A house with rooms that big needs huge windows on more than one wall in each room. Otherwise, cave. Especially a stone house. This one looks like a sad gray cave (the Ellen version). I love Ellen, her taste in decor – but not so much. La villa è molto bella e raffinata…. ma mi dà un senso di claustrofobia il tetto così basso e le pietre messe su tutte le pareti delle stanze… quasi povere di finestre… e nessun oggetto alle parete…. non sò se ci potrei vivere… mentre l’esterno della villa, l’ho trovato favoloso. The villa is very beautiful and refined …. but it gives me a sense of claustrophobia the roof so low and stones placed on all the walls of the rooms … almost … poor windows and no objects to the wall … . I do not know if I could live there … while the exterior of the house, I found it fabulous. Ellen and Portia have such lovely style. I cannot believe how beautiful these homes look!